Andrew Young flexes while competitor Derek Van Doorn, right, looks on. 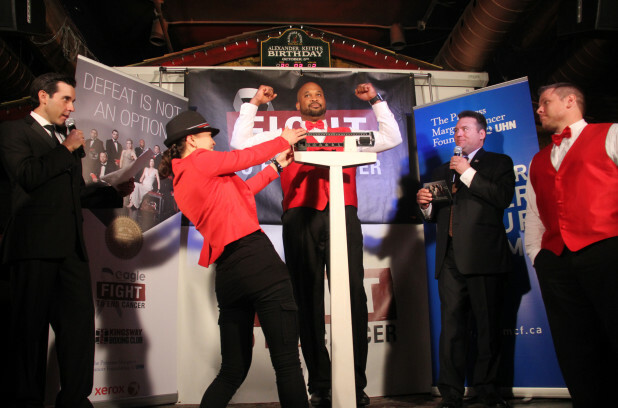 They will compete in the heavyweight bout of the 2014 Fight to End Cancer. Thursday May 22, 2014 Original Article Printed By Metro – A group of brave amateur boxers stepped on a scale as part of an unofficial weigh-in at Entertainment District bar Grace O’Malley’s Thursday night. The third annual Fight to End Cancer and gala, to take place on May 31, benefits the Princess Margaret Cancer Foundation. Ten white-collar men and women, with no prior boxing experience, have been raising money and training at the Kingsway Boxing Club for the past six months in preparation for the fight.